Learn more about Board Members Dr. Kelley and Mr. Pat Frost. The adage that “all health is mental health” applies to Ecumenical Center advocates and past board chairs Dr. Kelley and Mr. Pat Frost. 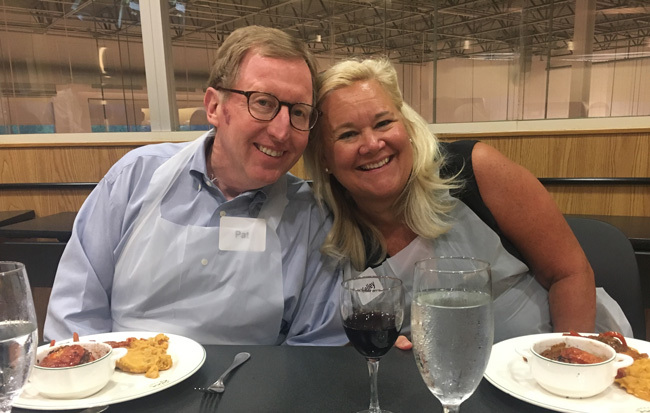 Active in the San Antonio biomedical community, both Kelley and Pat use their voices to stand up for the one in four adults diagnosed with mental health issues. Kelley maintains a private practice in Counseling, working with individuals, couples and families, and performed her clinical intern hours at The Center. Pat chaired the board of directors from 1998-2001 and co-chaired the Foundation Board with Kelley in 2014-2015. The Frosts expressed their belief that The Center offers something unique in San Antonio due to its proximity to the bustling Medical Center. “We have facilities dedicated to physical healing in all directions around The Center, but what makes this special, is its focus on restoration of mind, body, and spirit. Being involved with The Center on many levels has been an honor for both of us,” said Pat. Share the post "Board Member Spotlight: Dr. Kelley and Mr. Pat Frost"